Vinegar is a sour liquid produced from the fermentation of diluted alcohol products, which yields the organic compound acetic acid, its key ingredient. Used in many cultures as a condiment and preservative, vinegar can be made from a variety of liquids, including malted barley, rice, and cider; however, as its name suggests, it was probably first made from wine. The word vinegar derives from the Old French vinaigre, meaning "sour wine." Crucially, vinegar must be derived from a sugar-containing source in a two-step process. In the first stage, the sugars are broken down in the absence of oxygen (i.e., fermented) by yeast to produce alcohol (ethanol) and carbon dioxide. In the second stage, the addition of oxygen enables bacteria to produce amino acid, water, and other compounds. Thus, the British alternative to malt vinegar, called non-brewed condiment, does not qualify as vinegar because its acetic acid component is obtained directly by distilling wood chips, bypassing the first, ethanol-producing stage. Human creativity, in both advancing inner desire and external needs, has produced a wide variety of vinegars, with their own distinct colors and flavors. These are used for culinary (pickling processes, vinaigrettes, salad dressing, condiments), medicinal, agricultural, horticultural, and cleaning purposes. Though commercial production of vinegar continues to involve the natural action of bacteria, industrial methods accelerate the process, primarily through mechanisms that increase the bacteria's supply of oxygen (necessary for the conversion of ethanol into acetic acid). 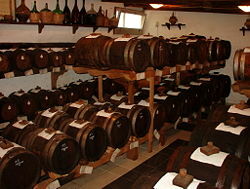 High-quality vinegars, such as the balsamic vinegars prepared in Modena, Italy, continue to be produced via a slow process of fermentation, typically aging for years in wood barrels. Vinegar is as old as civilization itself: traces of it have been found in Egyptian urns from around 3000 B.C.E., and Babylonian scrolls recording the use of vinegar date even earlier, to around 5000 B.C.E. Known as “poor man’s wine” (posca) in ancient times, vinegar was often carried by Roman legionnaires; the Bible notes that Roman soldiers offered vinegar to Christ at the Crucifixion. Today, vinegar remains an important element in European, Asian, and other traditional cuisines of the world; it is often used in pickling and in the creation of marinades, dressings, and other sauces. It also functions as a folk remedy and as a natural household cleaning product and herbicide. Acetic acid, also known as ethanoic acid, is an organic chemical compound with the formula CH3COOH. It is one of the simplest carboxylic acids. Though carboxylic acids are weak acids, they are stronger than the alcohols (-OH) from which they are derived, in part as a result of the electron-withdrawing power of their second oxygen atom (the greater number of oxygen atoms attached, the stronger the acid). The acetic acid concentration in vinegar typically ranges from 4 to 8 percent by volume for table vinegar (USFDA 1995), though higher concentrations are found in vinegars used for pickling (up to 18 percent). Natural vinegars also contain smaller amounts of tartaric acid, citric acid, and other acids. Acetic acid gives vinegar its characteristic sour taste and pungent smell. It also accounts for vinegar’s chemical properties. The pH of vinegar is typically in the range of 2 to 3.5, depending on the concentration of acetic acid. Vinegar has a density of approximately 0.96 grams per milliliter, depending on the acidity of the vinegar. Acetic acid is produced both synthetically and by bacterial fermentation. Today, the biological route accounts for only about ten percent of world production, but it remains important for vinegar production, as many of the world food purity laws stipulate that vinegar used in foods must be of biological origin. For most of human history, acetic acid has been made from fermented liquids by acetic acid bacteria of the genus acetobacter. However, their function was not understood until Louis Pasteur discussed the microbiological basis of vinegar in his 1858 work Etudes sur le Vinaigre (which was updated in 1864 as Memoirs sur la Fermentation Acetic). The first batches of vinegar produced by fermentation probably resulted from errors in the winemaking process. If must (juice of freshly pressed grapes, that contains various quantities of pulp, skins, stems, and seeds) is fermented at an overly high temperature, acetobacter will overwhelm the yeast naturally occurring on the grapes. As the demand for vinegar for culinary, medical, and sanitary purposes increased, vintners quickly learned to use other organic materials to produce vinegar in the hot summer months before the grapes were ripe and ready for processing into wine. According to the Orleans process (named after a town in France where high-quality vinegar is still produced today), vinegar is made in 50-gallon barrels packed with an oxygenating substance, such as chips of wood. When it reaches the desired degree of acidity, the vinegar is transferred to an aging barrel and left to mature to a mellow smoothness. One of the first modern commercial processes was the fast method or German method, first practiced in Germany in 1823. In this process, fermentation takes place in a tower packed with wood shavings, corncobs, or charcoal. The alcohol-containing feed is trickled into the top of the tower, and fresh air is supplied from the bottom by either natural or forced convection. The improved air supply in this process cut the time to prepare vinegar from months to weeks. Most vinegar today is made in submerged tank culture, first described in 1949 by Otto Hromatka and Heinrich Ebner. In this method, alcohol is fermented to vinegar in a continuously stirred tank, and oxygen is supplied by bubbling air through the solution. Using this method, vinegar of 15 percent acetic acid can be prepared in only 2–3 days. The longer fermentation period allows for the accumulation of a nontoxic slime known as the mother of vinegar, a mixture of acetic acid bacteria and soluble cellulose (in industrial fermentation, a man-made mother of vinegar called Acetozym is added as a nutrient). As with wine, the aging process also generates a complexity and depth of flavor lacking in newly-brewed vinegar, which tends to be sharp and harsh in taste. Vinegar can be made from any sugar-containing source that has been converted into alcohol. Each variety of vinegar has a distinctive color and flavor, depending on the material from which it was produced. Apple cider vinegar, otherwise known simply as cider vinegar, is made from cider or apple must, and is often sold unfiltered, with a brownish-yellow color. Cider vinegar is featured in many folk remedies (see below). Balsamic vinegar is an aromatic vinegar manufactured from the concentrated must of white grapes (typically of the Trebbiano variety), which is then fermented via a slow aging process that concentrates the flavors. The flavor intensifies over decades, as the vinegar is kept in fine wooden casks, becoming sweet, viscous, and very concentrated. Balsamic has a high acid level, but the sweetness covers the tartness, making it very mellow in flavor. Originally an artisanal product available only to the Italian upper classes, balsamic vinegar became widely known and available around the world in the late twentieth century. The finest and most traditional balsamic vinegar, manufactured in Modena, Italy, is very labor-intensive to produce; while it ages and gradually evaporates, the liquid is transferred to successively smaller casks made of different woods, absorbing the flavor characteristics of each wood and becoming more concentrated with each transfer. Oak, mulberry, chestnut, cherry, juniper, ash, and acacia are the most commonly used woods. Some older balsamic vinegar is added to the must to create a more complex and intricate taste, and to enhance acidity. The commercial balsamic sold in supermarkets is typically made with red wine vinegar or concentrated grape juice mixed with a strong vinegar that has been laced with caramel and sugar. However produced, balsamic vinegar must be made from a grape product. Malt vinegar is made by malting barley, causing the starch in the grain to turn to maltose. An ale is then brewed from the maltose and allowed to turn into vinegar, which is then aged. Malt vinegar is typically light brown in color. It is especially popular as a condiment to accompany the traditional pub fare of fish and chips in England. Rice vinegar is most popular in the cuisines of East and Southeast Asia. It is available in white (actually light yellow), red, and black variants. Because rice vinegar typically lacks a pronounced flavor, but some varieties are sweetened or otherwise seasoned with spices or other added flavorings. The Japanese prefer a light and more delicate rice vinegar for the preparation of sushi rice and salad dressings. White vinegar, which is actually transparent in appearance, is an example of a distilled vinegar. In the distilling process, the vinegar is first turned into steam using high heat, and then allowed to condense back into liquid form. This process destroys many of the nutrients present in the undistilled vinegar, resulting in a vinegar that is almost pure acetic acid. Most commercial white vinegars are five percent acetic acid solutions, and are made from grain (often maize) and water. White vinegar is used for culinary as well as cleaning purposes; it is a good choice for pickling because it will not alter the color of the vegetable being preserved. Wine vinegar, made from red or white wine, is the most commonly used vinegar in the cuisines of the Mediterranean countries and Central Europe. As with wine, there is a considerable range in quality. High-quality wine vinegars are matured in wood for up to two years and exhibit a complex, mellow flavor. Wine vinegar tends to have less acidity than white or cider vinegars. There are also wine vinegars made from individual grape varieties, such as Champagne, Sherry, or pinot grigio. Coconut vinegar, made from the sap, or toddy, of the coconut palm, is used extensively in Southeast Asian cuisine (particularly in the Philippines, which is a major producer), as well as in some cuisines of India. A cloudy white liquid, it has a particularly sharp, acidic taste with a slightly yeasty note. Cane vinegar, made from sugar cane juice, is most popular in the Ilocos Region of the northern Philippines (where it is called sukang iloko), although it is also produced in France and the United States. It ranges from dark yellow to golden brown in color and has a mellow flavor, similar in some respects to rice vinegar, though with a somewhat "fresher" taste. Contrary to expectation, it is not sweeter than other vinegars, containing no residual sugar. Fruit vinegars are made from fruit wines, usually without any additional flavoring. Common flavors of fruit vinegar include apple, black currant, raspberry, quince, and tomato. Most fruit vinegars are produced in Europe, where there is a growing market for high-priced vinegars made solely from specific fruits (as opposed to non-fruit vinegars that are infused with fruits or fruit flavors). Persimmon vinegar is popular in South Korea, and jujube vinegar is produced in China. Raisin and date vinegars are used in cuisines of the Middle East. Vinegar made from honey is rare, though commercially-available honey vinegars are produced in Italy and France. Kombucha vinegar is made from kombucha, a symbiotic culture of yeast and bacteria. Kombucha vinegar is primarily used to make a vinaigrette and flavored by adding strawberries, blackberries, mint, or blueberries at the start of fermentation. Popular fruit-flavored vinegars include those infused with whole raspberries, blueberries, or figs (flavorings derived from these fruits may also be used). Some of the more exotic fruit-flavored vinegars include blood orange and pear. 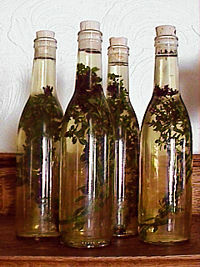 Herb vinegars are flavored with herbs, most commonly Mediterranean herbs such as thyme or oregano. Such vinegars can be prepared at home by adding sprigs of fresh or dried herbs to store-bought vinegar; generally a light-colored, mild-tasting vinegar such as that made from white wine is used for this purpose. Sweetened vinegar is made from rice wine, sugar and herbs including ginger, cloves, and other spices. Vinegar is commonly used in food preparation, particularly in pickling processes, vinaigrettes, and other salad dressings. It is an ingredient in condiments, such as mustard, ketchup, and mayonnaise, and an essential component of chutneys, marinades, and other sauces. The use of cider vinegar as a beauty aid also persists. The British Romantic poet Lord Byron, for example, would consume vast quantities of white vinegar in an attempt to keep his complexion pale. Though few of the remedies above have been verifiable using controlled medical trials, clinical trials have revealed that small amounts of vinegar added to food, or taken along with a meal, reduce the glycemic index of both healthy and diabetic recipients after a high-carbohydrate meal (Liljeberg and Bjorck 1998; Leeman et al. 2005; Johnston et al. 2004; Sguiyama et al. 2003; Ostman et al. 2001). Multiple trials indicate that taking vinegar with food increases satiety (the feeling of fullness), reducing the amount of food consumed (Ostman et al. 2005; Roberts 2000). Even a single application of vinegar can lead to reduced food intake for the rest of the day (Almada 2006). White vinegar, diluted with water, is often used as a natural household cleaning agent. It is especially useful for cleaning mineral deposits on glass and other smooth surfaces. Care should be taken not to allow contact with eyes (if such contact occurs, the eyes should be flushed immediately and persistently with warm water) or skin (the affected skin area should be washed thoroughly after use). Vinegar can be used as a herbicide, as shown by scientific trials reported by the United States Department of Agriculture in 2002 (Comis 2002). The trials showed that a number of common weeds could be effectively controlled using vinegar with five percent to 20 percent acetic acid (lower concentrations are less effective). A crop of corn can be sprayed with vinegar at 20 percent strength without causing harm to the crop. Acetic acid is not absorbed into root systems, so vinegar will kill top growth but perennial plants will reshoot. Since vinegar made from natural products is classified as organic, there is interest in using vinegar as an herbicide on farms certified as organic. Almada, A. 2006. Carb and weight control through acetic acid? Functional Foods and Nutraceuticals. Retrieved June 11, 2007. Comis, D. 2002. Spray weeds with vinegar? United States Department of Agriculture. Retrieved June 11, 2007. Johnston, C. S., C. M. Kim, and A. J. Buller. 2004. “Vinegar improves insulin sensitivity to a high carbohydrate meal in subjects with insulin resistance or type 2 diabetes mellitus.” Diabetes Care 27: 281-282. Leeman, M., E. Ostman, and I. Bjorck. 2005. “Vinegar dressing and cold storage of potatoes lowers postprandial glycemic and insulinaemic responses in healthy subjects.” Eur J Clin Nutr 59: 1266-1271. Liljeberg, H., and I. Bjorck. 1998. “Delayed gastric emptying rate may explain improved glycemia in healthy subjects to a starchy meal with added vinegar.” Eur J Clin Nutr 64: 886-93. New Mexico State University, College of Agriculture and Home Economics. 2004. “Vinegar as herbicide.” New Mexico State University. Retrieved June 11, 2007. Ostman, E., Y. Granfeldt, L. Persson, and I. Bjorck. 2005. “Vinegar supplementation lowers glucose and insulin responses and increases satiety after a bread meal in healthy subjects.” Eur J Clin Nutr 59: 983-988. Ostman, E. M., H. Liljeberg, H. G. Elmstahl, and I. Bjorck. 2001. “Inconsistency between glycemic and insulinemic responses to regular and fermented milk products.” Am J Clin Nutr 74: 96-100. Roberts, S. B. 2000. “High-glycemic index foods, hunger, and obesity: Is there a connection?” Nutr Rev 58: 163-169. Sugiyama, M., A. C. Tang, Y. Wakaki, and W. Koyama. 2003. “Glycemic index of single and mixed meal foods among common Japanese foods with white rice as a reference food.” Eur J Clin Nutr 57: 743-752. United States Food and Drug Administration (USFDA). 1995. “Sec. 525.825 Vinegar, Definitions - Adulteration with Vinegar Eels (CPG 7109.22).” United States Food and Drug Administration, Department of Health and Human Services. Retrieved June 15, 2007. All links retrieved January 21, 2016. This page was last modified on 21 January 2016, at 15:19.